Tsoknyi Rinpoche (Tib. ཚོགས་གཉིས་རིན་པོ་ཆེ་, Wyl. tshogs gnyis rin po che) or Ngawang Tsoknyi Gyatso (b. 13 March 1966) – the third Tsoknyi Rinpoche was recognized by His Holiness the sixteenth Gyalwang Karmapa as the reincarnation of Drubwang Tsoknyi Rinpoche. 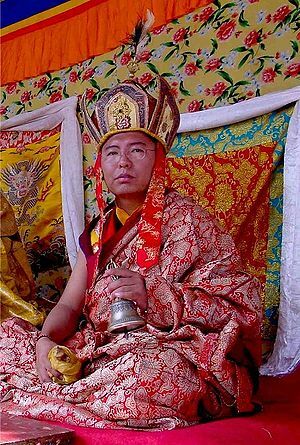 He is a renowned master of the Drukpa Kagyü and Nyingma traditions and the lineage holder of the Ratna Lingpa Lineage and the Tsoknyi Lineage. Since 1991, Tsoknyi Rinpoche has been teaching in the Dzogchen tradition, communicating from the ancient teachings into the modern mind, and is one of those rare teachers whose lighthearted yet illuminating style appeals to both beginners and advanced practitioners. His main teachers were Khamtrul Rinpoche Dongyü Nyima, his father Tulku Urgyen Rinpoche, Dilgo Khyentse Rinpoche, Nyoshul Khen Rinpoche and Adeu Rinpoche. This page was last edited on 6 August 2018, at 07:41.